“The Split Tracks mean the audio and lyrics are perfectly in sync, without needing either another computer or operator to control the separate areas. Split tracks are video backing tracks with on-screen lyrics & mixable vocals. They run using free software such as VLC or iTunes and are in MP4 format. Watch the video below for more information. You can download individual Split Tracks from the Worship Backing Band website or alternatively buy them as compilations on our DVDs. Split Tracks are simple-to-use video backing tracks in MP4 format mainly used by churches or small groups with no musicians. The tracks feature on-screen lyrics which move automatically in time with the music as well as mixable vocals. This means you can have vocals from zero to full volume depending on whether you have confident worship leaders or not. 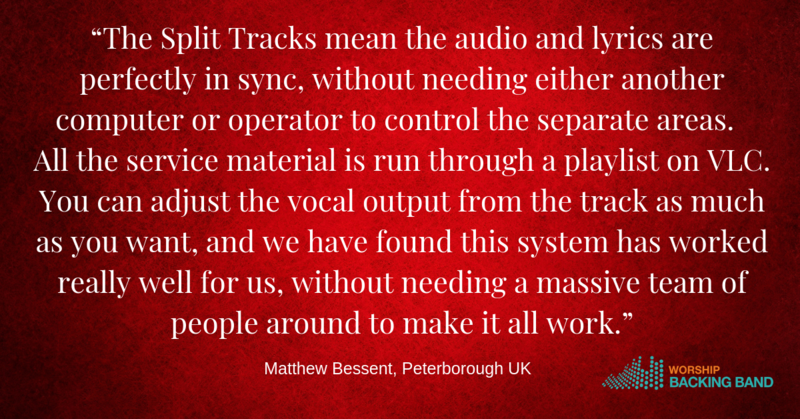 You can use Split Tracks on a Mac, PC, tablet or even a phone without any specialist software. They simply use something like the freely available iTunes, VLC or Real Player. Split Tracks are not MultiTracks so will not work in our Mac,PC or iPad MultiTrack players. If you want additional functionality such as key change or the ability to repeat song sections then you need the MultiTrack Player. Information on Split Tracks in the video below or click the link here to see what is available and to buy the tracks. Volume discounts available when you buy 10 or more Split Tracks at the same time. Further price breaks at 25 and 50 tracks. You also benefit from great bundle discounts available when you buy ten or more Split Tracks at the same time. Here’s a quick video showing you how our Worship Backing Band compilation DVDs work. The DVDs have 35 Split Track backing tracks on each volume. You copy the songs to your computer, tablet or phone and then make your own set lists for use in church. 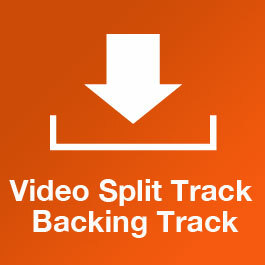 Here’s a quick video showing you how our Split Track backing tracks work.